I met up with wildlife photographer Jim Glynn of Great Bend to photograph around Quivira National Wildlife Refuge and the Cheyenne Bottoms area the morning of November 7th. My main motivation for this particular trip was to hopefully observe and photograph the endangered Whooping Crane, for I have never seen one before in the wild. For those who don’t know, the Whooping Crane uses Cheyenne Bottoms and the Quivira NWR as a stopover on the way south to the Aransas NWR along the Texas gulf coast where they winter. 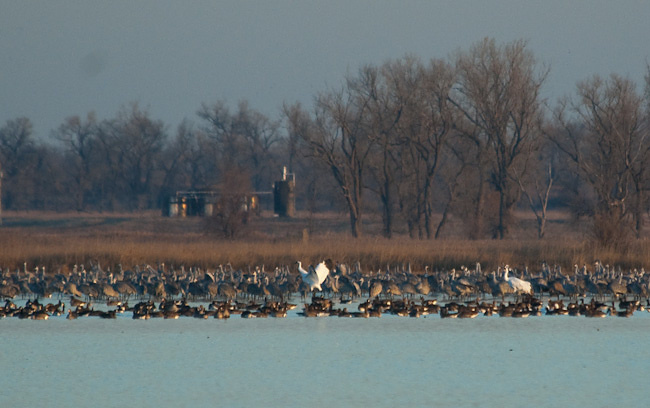 What is known as the “Wood Buffalo-Aransas” flock, this is the only wild, relatively self-sustaining flock of Whooping Crane with a flock population of only about 250 birds. 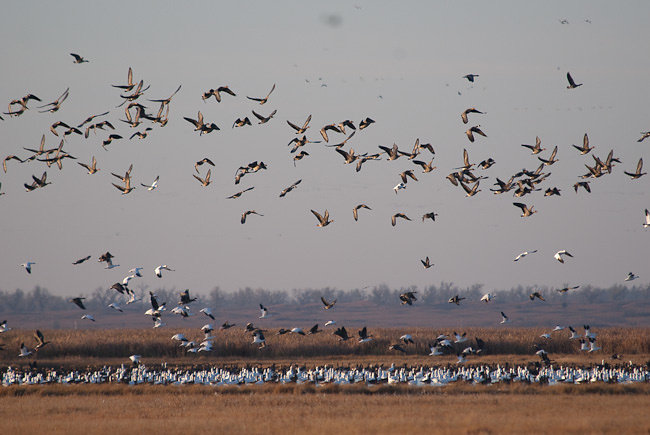 Their flight migration from the Aransas NWR to Wood Buffalo National Park in Canada takes them directly over Central Kansas during the spring and autumn. Usually their stopover in the autumn is longer, but this depends largely on the weather. Upon reports of over a dozen Whoopers at Quivira late last week, I decided I needed to take a visit to take advantage of an opportunity to photograph a Whooper. I arrived shortly before sunrise Saturday morning and met up with Jim on the east-west sand road that cuts through the north part of QNWR just north of the Big Salt Marsh. Around sunrise, we observed a pair of Whooping Cranes right away north of the east-west road (NE 170th Ave.) which Wildlife Drive connects to. 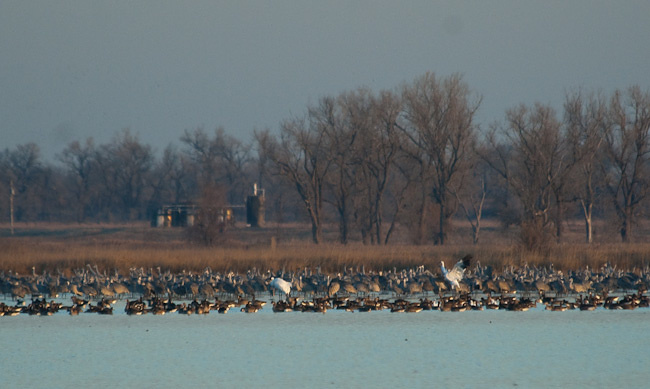 These two Whoopers were mixed in with a bunch of other Sandhill Cranes as well as some White-fronted Geese. We got information of more Whoopers on the other side of QNWR about 9 miles south, so we took a leisurely drive south…stopping occasionally to photograph some white tail does and a couple bucks. On the south side of the Little Salt Marsh, we spotted another pair of Whoopers (for a total of 4) all alone which we photographed from the observation tower that stands on the south side of the marsh. The 80-400mm Nikon lens is only just enough length to positively identify the Whoopers, but that’s about it. I really need more length for much better images!!! 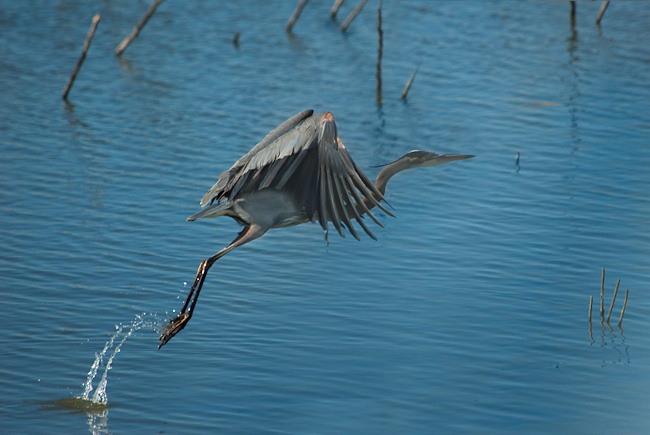 A number of Sandhill Cranes in flight. A pair of Whooping Cranes visible as well, just north of Wildlife Drive at QNWR. 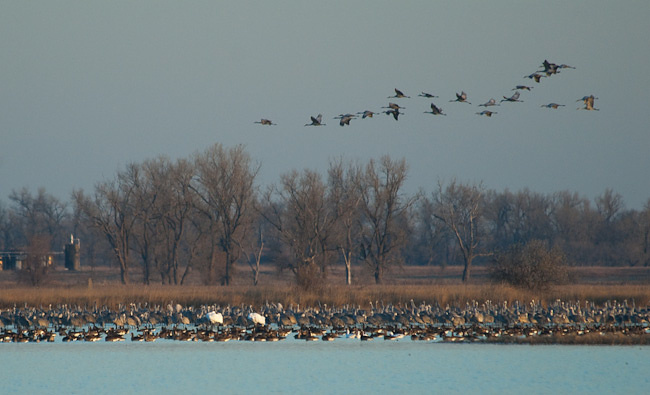 Sandhill Cranes in flight with a number of Snow Geese also mixed in. 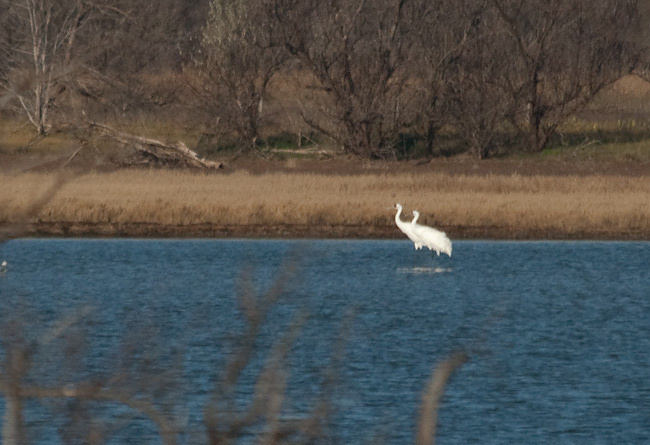 This is the second pair of Whooping Cranes we observed this morning (for a total of 4). These two were all by themselves with no other cranes around. This was looking due west from the observation tower that overlooks the Little Salt Marsh at QNWR. 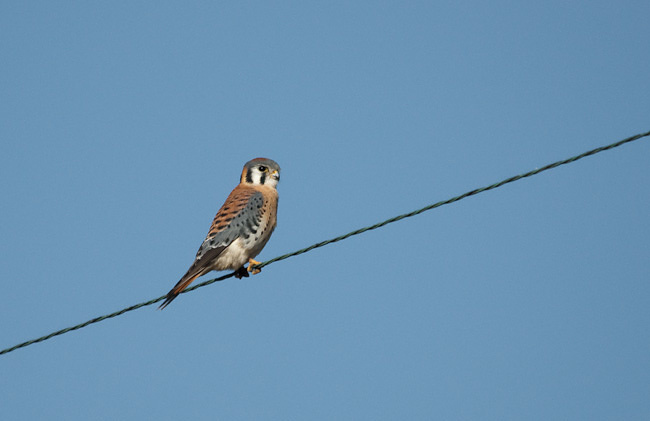 A beautiful American Kestrel perched high atop a powerline at QNWR. 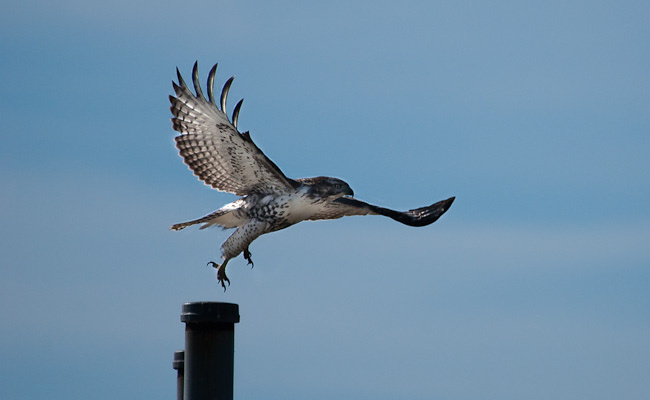 A Red-tailed Hawk taking off from its post at Cheyenne Bottoms. 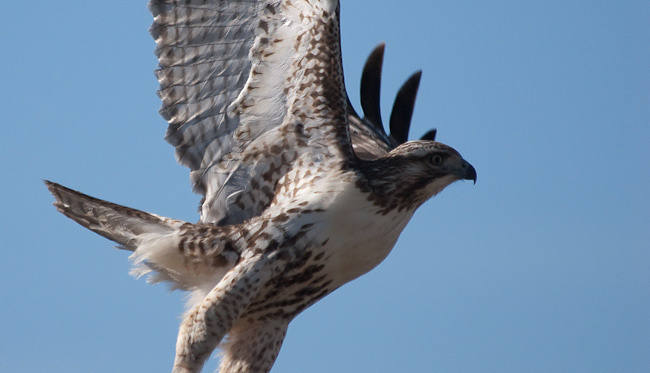 Close-up image of a Red-tailed Hawk in flight at Cheyenne Bottoms.